I know I keep saying that I’m done with the living/dining/entryway that I just painted, for the 2nd time, but I guess I can’t leave well enough alone. I see something that doesn’t look quite right and I have to change it…as in right now. Let’s take a look back to right after we moved in last June before anything was painted. 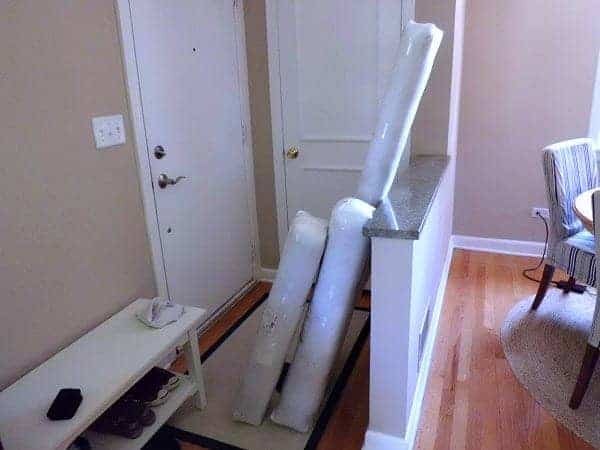 This was the only picture I could find (those packages are my first set of living room blinds) but you can see the white front door, white closet door, swine colored walls and green marble on the half wall. 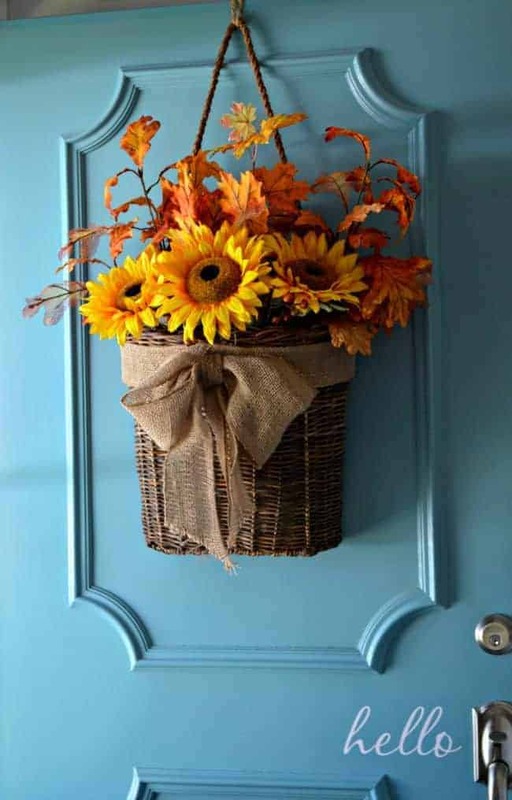 The first thing I did was to paint the door a lovely shade of blue, Ben Moore Blue Lake. I also added a bench to put on our shoes, some carpet squares and a coat rack made with an old piece of wood and 3 numbered hooks. 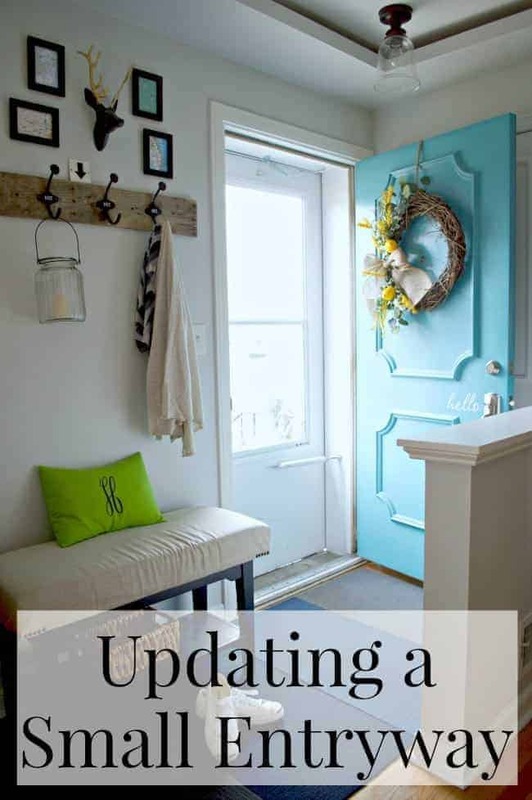 The inside of the door was plain, no molding, so I decided to try to paint “faux” molding to give it a little style, I explained how I did it here. I also painted the walls with Benjamin Moore Thunder. This was how I left the space for a few months, but the white closet door bothered me. 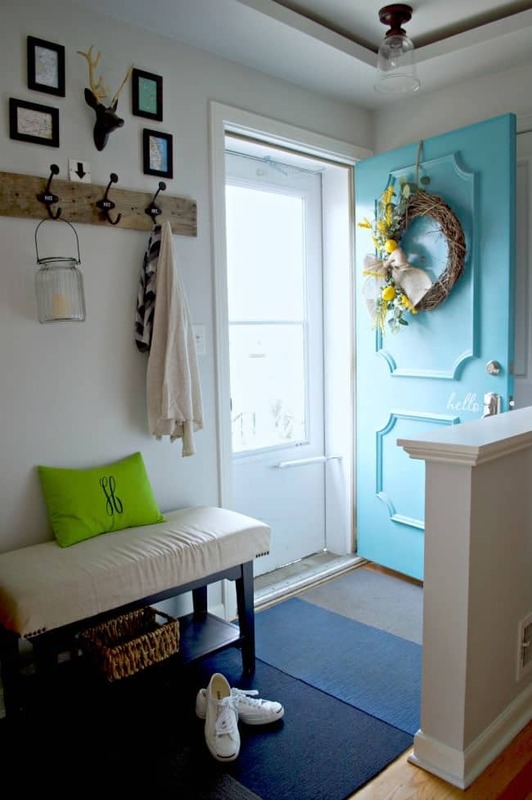 There was just too much going on with the blue door, in such a small space, so I decided to paint it the same color as the walls. We also built and painted a knee wall to cover the green marble on the half wall. Things are starting to shape up! After the really long winter we just had, and because this North facing room gets no direct sunlight, I found that the paint color on the walls was just too dark. I decided to change the color and go for something lighter so I painted them Benjamin Moore Gray Owl at 50% strength. I was loving the lighter and brighter color but I felt that I needed to add a little something to the wall where the coat rack hangs and I’ve also been wanting to paint the bench that was all dinged up. 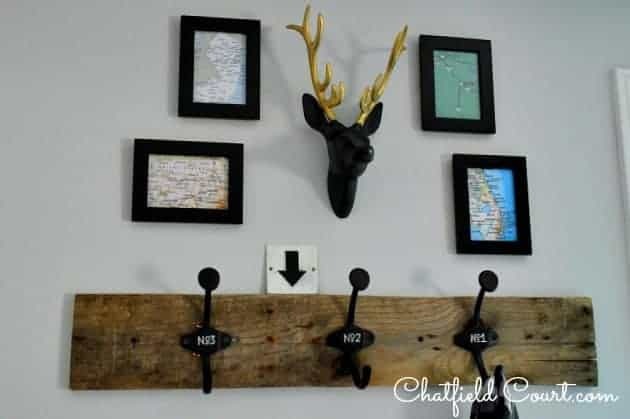 I like my silver deer head but he was looking a little lonely, so after searching for something to hang with him, and not finding anything I liked that would fit in the small wall space, I decided to make my own art. 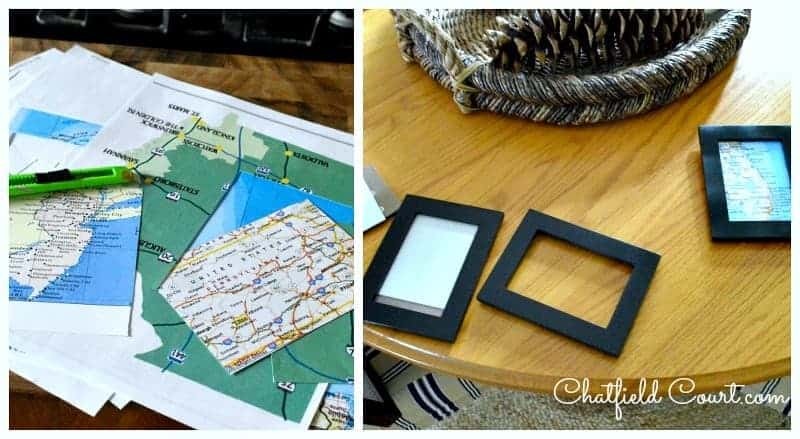 I had several small frames that I spray painted black and I added maps highlighting the towns in the states that we have lived in…New Jersey, Pennsylvania, Georgia and Florida. I also gave Mr. lonely silver deer a makeover using oil rubbed bronze and some gold spray paint (love the shiny gold). I ended up spending about $12 to buy two cans of spray paint to do these updates, since I already had the deer head and frames and I printed the maps. Big changes in a small space for not a lot of money. There are still a few things I would like to change down the road, like changing out the storm door and I really want to get a new front door that has some windows to lighten up this area. I’m thinking that I want to put a cushion on the bench too, it gets dinged up easily from Finn’s leash and the car keys, but that can wait a while. Update: I finally upholstered the bench and this is what the entryway looks like today. You can check out my tutorial on upholstering the bench here. Do you ever just look at something in your house and think that you have to change it…like now? Tell me I’m not the only one. That faux molding is too cool!!! Amazing transformation, Kristi! Thanks so much Kristi! I appreciate your visit. Thanks so much. I can’t stop thing about something until I do something about it too. I’m glad I’m not alone. Thanks so much for your kind words Emily! I was surprised at how much the color change made. I’m glad that I did it. I appreciate your visit. Your entry looks great. Making mine over is on my long to-do list! Thank you so much! It’s nice to see others in the “always changing things” club. 🙂 I appreciate your visit. I LOVE your beautiful blue front door!!! 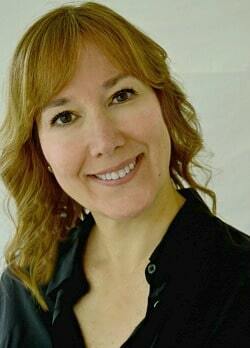 I’m featuring it tomorrow in my Friday Features… so pretty! Thanks for linking up! Wow, that’s so great! Thanks so much Maryann. Don’t worry we all have the same addiction 🙂 Love the blue door. Its gorgeous! I look forward to seeing you at My Dream Canvas. Thank you Anu! I appreciate your visit and will head over to see you. Your entry is looking really good 🙂 Love the blue on the front door and the glossy black bench. 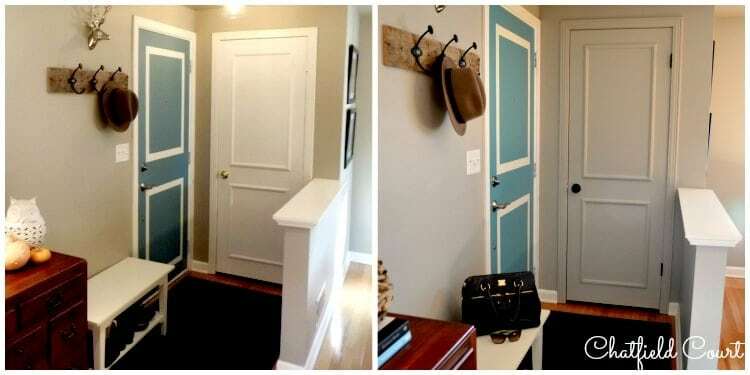 And great idea to paint the closet door the same colour as the walls. 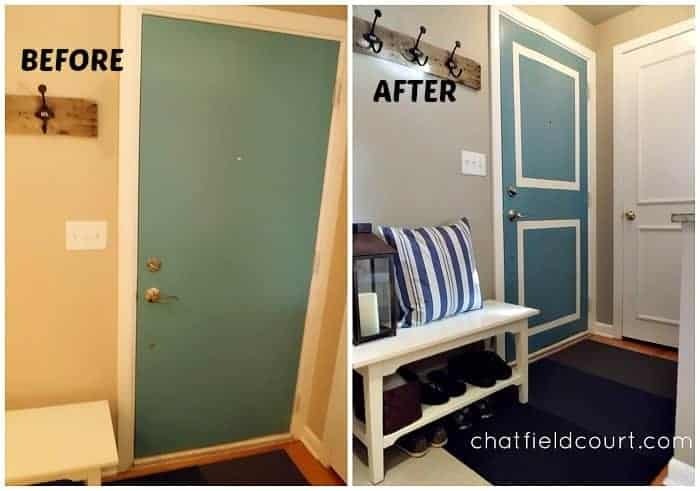 Love the blue door and the changes you have made. I can definitely relate to wanting to change or tweaks things in my house constantly. Thanks Lauren! My husband wasn’t thrilled about it either and he didn’t think the “faux” molding would work but I think he is ok with it now. Love the idea of the maps representing places you have lived and Mr. Deer stands out with his new snazzy paint job. He was kinda lost with his previous look against the gray walls. Replacing your front door with one that has a window will make a huge difference. Our entryway is approx. 3 feet by 3 feet and the previous owners did replace both the front and back doors with a vented window style. They’re kinda “blah” and probably not what I would have chosen but I’m glad they didn’t opt for a solid door. Thanks Shirlee. I agree about Mr. Deer fading into the background. I like him much better. Thank you for visiting and for commenting. I truly appreciate it. Thanks Liz. It is a tough space to decorate (and to photograph) and I have a feeling that I will always be tweaking it. 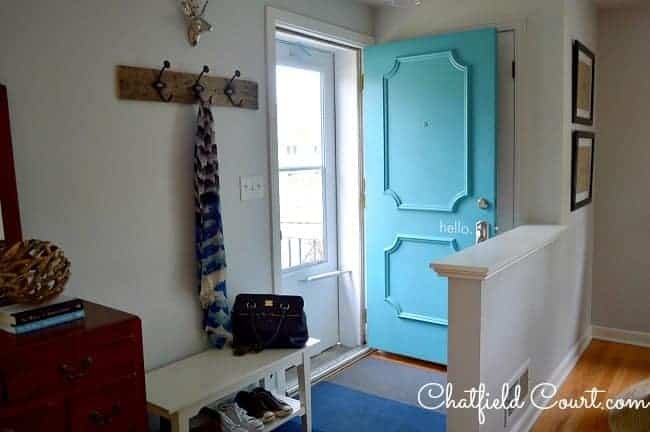 Kristi, I came into reading your blog after you made the changes to the entryway so although I thought it looked great I didn’t see the before and after. I could understand your reasoning for the changes you made and I can relate to the front door thing! My entryway is even smaller, if you can imagine that! And I have the front door and closet door thing too! We don’t use our front door because we have a door from the garage, but company does use the front door. It’s always an area that I want to change too. So you’re not the only one! I think what you have done looks great and I like the bench in black and the wall decorations are perfect! Looking forward to seeing your guest bedroom. Hi MJ. I remember you telling me about your small entryway and we discussed using the carpet tiles in the space. I’m sure you get that it is a difficult space to decorate so I appreciate your kind words. As always, thanks so much for visiting!